Always have a great experience when I go in for an adjustment. Everyone is always friendly and efficient. Would recommend anyone with back problems go visit them! Every one was very friendly and professional. Office clean and neat. Procedures explained fully. Will recommend. Great place great people!! They know what there doing!! As always everyone in office is very professional but personal. They always make me feel welcome. Staff is very impressive. I am so glad to be a patient of Pruni Chiropractic. I would recommend them to anyone! 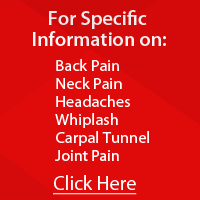 I've been going here for several years and have not had any complaints on the treatments or the staff. Everyone has been great . I have been going to Pruni Chiropractic for some time now. Every one there is so helpful and friendly and they have done a great job of helping me with my back problems. I would highly recommend them to anyone who has any back or neck problems. I'm so glad my first experience with chiropractic care was with Pruni Chiropractic! It will definitely be a part of my routine healthcare for well-being. The staff and doctors are very friendly, and personable. The staff gets to know you personally, and the atmosphere is welcoming. Was very impressed with the professionalism shown to me and my husband. They went out of their way to make sure we understood my problem and how they were going to fix it. Staff is always so friendly and helpful. Very glad we found this practice! Everyone in the office is very professional and friendly. Never a bad experience or long wait. Very impressed with the staff and doctors. thanks! Everyone in the office is very professional and friendly. Never a bad experience or long wait. Very impressed with the staff and doctors. Everybody in the office is very caring and does everything they can to provide every patient with a great visit! Just a amazing office! The office staff is very friendly, and the Doctors and Nurses very helpful. WONDEREFUL!!! You know I love you guys/gals! You know I love you guys/gals! The staff is so friendly, yet professional and always willing to work with me on my schedule. I am so pleased with the result from my treatments. My back and neck haven't felt this good for a very long time. My only regret is why I didn't make an appointment sooner. I am so thankful that a co-worker told me about you along with a good recommendation. I always enjoy the time to take care of myself and enjoy all the pleasant personalities that I encounter at Pruni Chiripractic! While this was only my second visit, everyone at Pruni Chiropractic are welcoming and courteous. Everyone goes the extra mile to explain everything they're doing. I would give the staff a 5 Star rating, but I'm reserving the 5 Star to see the effectiveness of my long-term care. Being a long time patient of Drs. Being a long time patient of Drs. Uvena and Pruni, I can tell you that my experience with them and their very competent and caring staff has been nothing short of excellent! Thank you! Just want Dr. Pruni and his team to know how much i appreciate them. I've not understood why my spine felt as bad as it did for so many years. Dr. Pruni and team worked with me till they figured out everything in my spine. Im not blinded anymore. Thanks so much for caring and going that extra mile for me!!! Your a wonderful team!!! My goal is to continue therapy so i can continue healing!!! Very caring knowledgeable doctors and staff. Very friendly, fast service. Would recommend to anyone. It has taken several visits, but the pain has gotten significantly less in my neck and left shoulder. Chiropractic treatments seems to be the only think that helps. they are very helpful. See you in 2 weeks! As always, I was very pleased with the care I received at Pruni Chiropractic. The staff treat the patients with kindness and compassion and the doctors take much time to provide the best treatment for the problem. Very caring and friendly people! Treatments seem to be helping. Treatments seem to be helping. Sleeping better not as stiff in mornings. The staff are very friendly and caring and the adjustments really help you feel better. Thanks so much for caring. Overall was good. Both Doctors were very attentive and took their time with me. Anticipating to feel better very soon. I have gotten great results at Pruni Chiropractic! I see overall improvement in pain relief and flexibility. The staff is professional and friendly. Just a wonderful office. Also, the various methods of therapy have been useful in achieving results faster than I have experienced in the past when I had adjustments alone. They are the best! Very friendly staff, excellent doctors. You are all great! Nothing bad to say and I recommend you to everyone that asks. You guys r awesome! Love u all! You guys r awesome! Love u all! So glad Magic has joined the group! Anyone who is reading these comments needs to know this. Pruni Chiropractic wasn't named #1 in Tusc county for nothing. If they can't help you, no one else here on God's green earth can. You guys ( and this includes EVERYONE) are A#1!!!!!!!! My experience at Pruni Chiropractic is always excellent. They are friendly, yet professional. Would recommend them to anyone!!! Feel great. Thanks a bunch. Best office to visit! Staff is always so friendly and Doctors are really good about explaining everything. Everyone at this office is so kind and accommodating. Dr. Pruni shows a genuine interest in getting me back to normal and wrestling. I am so happy that I chose Dr. Pruni for my back problem. I have never physically felt better. I have never physically felt better. The staff is always friendly and Dr Pruni seems to sincerely care about his patients well being. The service and friendly staff can't be beat! Awesome of course. Great find in Kendal (sp) aka Magic fingers. LOL Love you guys!!! Happy Thanksgiving!!! I fell and was having excruciating headaches and soreness in my neck and shoulder. Bruni Chiropractic has helped me alleviate the pain I was experiencing and is helping me on the road to wellness. As expected I was treated well from the time I walked in. From the front desk to the doctor, all went well. Since day one every time I've went in I've been treated well and I have not had to wait long for any of my appointments. I have improved steadily each day and I am feeling great. Dr. Uvea and Dr. Pruni are excellent and very friendly. I would and have recommended them to friends and family. Very friendly staff that really knows what they're doing, and truly cares about your situation! Pain relief without drugs and the "therapy" is amazing! If I didn't live so far away now, I would still be coming in for appointments. Two adjustments and almost $150 and no relief yet. A couple more visits and see what happens. Always a friendly and professional experience. This is the BEST thing you can do for your health - I can't believe how much better I feel with regular adjustments! Thanks Drs. Pruni and Uvena. After being away bc of complications from my pregnancy it was wonder to see everyone at the office again. I cant even explain how great I felt after my adjustment today! Everyone is kind, caring, and all about promoting a healing experience. Adjustment didn't fix the problem at all this time! Last month Dr. Uveno actually put my back in place that had been out for over a year. It felt SO good. I was so excited. After carrying a heavy grandson on vacation, my back popped back out. This week Dr. Uveno adjusted my back but it did not pop back in. It hurts worse this week than it has in a long while. May have to come in earlier than 4 weeks. It is important to remember with chiropractic care that, depending on our activity, it often takes more than 1 adjustment to correct a problem, especially one that has been out of alignment for some time. Always communicate how you are responding to your care with your Doctor so that he or she may better treat your condition. Feel good. Thanks for the adjustment. My experience at Pruni Chiropractic has been wonderful. I have had back pain for several years using both injections and pain killers to try and relieve the pain in my back with some relief but with not much in help of sleep. I can now say that I am sleeping better and the pain is so much better. I have stopped one pain pill completely. I thank Dr. Uvena for everything he has done for me. Always treated good when I've gone there and always look forward to next visit. I feel special from the moment I walk into Dr. Pruni's office. Everyone is kind, efficient and most importantly caring about each patient's individual needs. Anyone who can humor the Cox team, deserves high praise. Megan Ripley's face is a beautiful addition to the office!! The Chocolate Raspberry coffee to go, was splendid. Thanks, Ashley for you patience with me when I called to ask about the flavor!! I do have to say, Dr. Pruni and staff are top in the field. Enjoyed each visit, and feeling better. Great visits. Very helpfull and happy staff. Looking forward to going more. After 2 years of suffering from a serious work injury, The entire staff at Pruni Chiropractice has been the single biggest factor in my continuing recovery. I did not remember what it was like to wake up without headaches, and be able to stand and walk with less and less pain as time goes on. I always feel great after having an adjustment. Very accommodating to a busy schedule. They have actively participated in many aspects of my healthcare. My visits to the Pruni Chiropractic office have been very positive. Everyone is friendly and professional. The office is ran smoothly, with little or no wait. I feel relaxed during my visits and not rushed,and that my needs are being met. I think I will find relief and am looking forward to it. YOU GUYS ALWAYS KNOW HOW TO HELP ME. GOD BLESS! I have been there for several different issues thinking i would never get better,but they fix me every time.They are the best at what they do.The staff are all great too. I have been going to Dr.Pruni's Office for 7 years. Both Dr Pruni and Dr. Uvena are wonderful in helping pin point the problems and work hard correcting the misalignment and making me feel better. The Office Staff are outstanding for customer service and always making everyone feel welcome. The office always has an uplifting atmosphere, making you feel better when you walk in the door. They always take good care of you as well as making you feel like family. I always leave Pruni Chiropractic feeling so much healthier than when I enter. Dr. Pruni has helped me control a chronic back problem and has allowed me to maintain my active lifestyle both at work and with exercise. The staff is always friendly and caring and provide an efficient and professional experience on each and every visit! After my appointment yesterday, my neck feels great and my morning headache was not there. Thanks. staff is so personable and love the treats they have each available! Thanks for helping to make me feel better. Tell Dr Uvena his magic machine worked wonders on my cheek. It was 50% better as I was leaving the parking lot. It hardly even hurts now. Thanks again. You guys ROCK!!!!!!! YOU GIRLS DO TOO!!!! LUV YA ALL. You have gotten me through bad times and good. Always with love and kindness. Smiles even when you were having your own bad day. Thanks for all you do! Wonderful employee's,, got me in quick when I called without an apppointment,they treat me very kind while I'm there,& I've never trusted a doctor as much as I do Dr. Pruni,he has helped me with my pain & I'm not nervous when he works on my problem areas,& I have a better understanding of whats wrong with me,I have recommended him to friends & family. I always feel like a new woman after a visit to Pruni Chiropractic. I love everyone there. The entire visit is very uplifting from the moment I walk in the door, until I say "goodbye until next time". The title says it all-I always have a positive experience when I am at Pruni Chiropractic. The staff and the doctors always treat me with kindness and respect and I am feeling much better since becoming a patient. They truly care about your well-being and take time to treat the whole patient. This was a wonderful visit and I honestly can't wait to go back. Wonderful staff,great atmosphere and very comfortable! I have been going to the Pruni Chiropractic office for 14 years. My back was so bad I could hardly walk. But now I am in great shape and I go 2 times a month to keep it that way! Love you guys!!!!! There's nowhere better!! After going to another chiropractic office for over three years, I am very glad to have been able to begin working with Dr. Pruni and his office staff. I feel that they truly care about the patient needs and make you feel very welcome in the office. I have been a patient since 2001 and I believe that if i hadn't come to Pruni Chiropractic I would be in a wheelchair by now. When I began treatment I was unable to walk without severe back pain. The treatment I recieved enabled me to resume my activities. I have continued with treatments due to declining health and have been helped immensley by continuing treatment. I would recommend and have recommended Pruni Chiropractic to family and friends. I will continue with recommendations to anyone who tells me they have problems. I have been helped with not only my back problems but asthma and COPD.